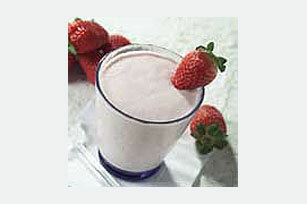 Tropical fruit low-calorie drink mix, frozen nonfat yogurt, strawberries and banana are blended into a frothy drink ideal for breakfast or a snack. Place prepared drink mix, yogurt and fruit in blender container; cover. Blend on high speed until smooth. Serve immediately. Substitute CRYSTAL LIGHT Fruit Punch Flavor Drink Mix for CRYSTAL LIGHT Strawberry Orange Banana Flavor Drink Mix.